Why should I sell the Rose of Jericho plants? Many people seek for this unique plant, because it comes with religious legends, the fact that the Rose of Jericho / Doradilla Flower represents a holy item in many religions and pagan / wiccan rituals, makes it a very popular gift item. The plant, for its amazing ability to transition from a brown, dry ball, into an open, green and lush plant, also called resurrection plant is widely used not only as a gift to Catholic followers, but also by many others. Here you can find some examples in which way the plants can be used in your prayers and rituals. In the delivery room under the bed in which the infant should be conceived, place a glass dish with enough water so that the Rose of Jericho gets its roots wet. At the point when the Rose of Jericho opens, put a couple of scissors on top of the plant and a smaller statue of the infant Jesus, the kind utilized as a part of a Nativity set, or a Madonna with Child, Saint Gerard Majella, or Saint Margaret. This will guarantee a protected delivery for both mother and the child. If it is difficult to place it under the delivery bed, place it on a sacrificial stone or on a table other than the work bed. The appeal is given to the mother and the Rose of Jericho is dried out furthermore given to the mother with the directions to place it in water for a week, each year at the childs birthday. 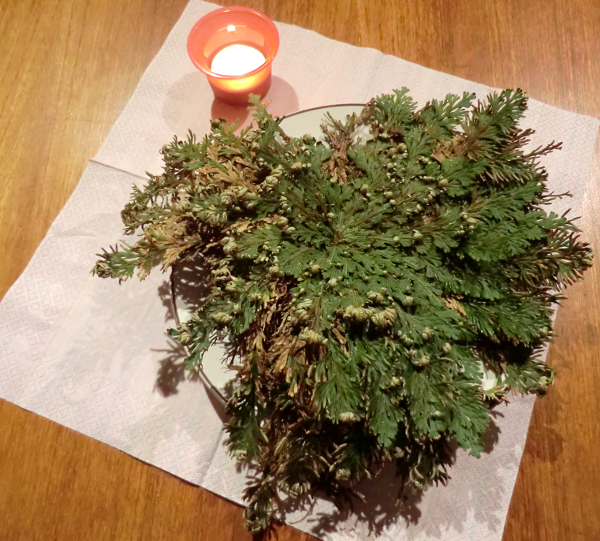 Place the Rose of Jericho into a clear glass dish of water, and inside of it place 5 coins. Next to it, light a green or gold flame to pull in wealth and abundance, and appeal to God for five days in a row. An appeal to Our Lady of Charity can likewise be set into the dish and utilized as an appeal to pull in cash. You may also write down a wish for something you’d like to have and place it inside the plant – and when you have received what you prayed for, you may let the rose open again and sacrifice a gift to god on your holy altar place (like good food, high quality Incense, a precious stone, Palo Santo or a small amount of gold). You’d like to get a Rose of Jericho plant, but not in wholesale? A ritual or just nice. It’s up to you! TO REMOVE ENVY Also, THE EVIL EYE. On a Tuesday or Friday at around 9:00 in the morning, place the Rose of Jericho in a dish of water with a plain stone or Mano de Azabache on top of the plant. Light a white flame and think and implore before it for 3 back to back days. On the third day, take the water and empty it into a sacred ritual bottle with one single drop of holy water. Shower the outside of the house, every entryway, passageway and window of the house, appealing to your soul guide for help. This shall remove any negative vibration, jealousy or envy others may have for you and your belongings. Enter the Rose of Jericho in a dish with water. Write down your longings and wishes with ink on a piece of paper. If it is a sure occupation or position you wish take the application or employment resume and fold it fifty-fifty with a loadstone in the water with the Rose of Jericho. Do this 3 to 7 days prior to you give the application or employment resume. Because of the individual way of the appeal being made, a few subtle elements will be overlooked from this record. In any case, the essential procedure is being passed along to your understanding. This will show an individual, simple but effective appeal I preformed, including a Rose of Jericho (Resurrection Plant) and a Saint Expedite flame. If you are not acquainted with the Rose of Jericho, they are wonderful plants. They are considered talismans for assurance, gift, and success. At the point when torpid they look like tumble weeds or dead cedar limbs. They are in different forms and several different species exist, but they perform wonders and solve problems through the supplication of our prayers. As you can see, I have placed it in a bowl containing a couple inches of water. Once placed in water, it begins to open up. After several hours it will open up. On the seventh day, a Wednesday (I picked this day in light of the fact that it is the customary day to work with Saint Expedite. ), I expelled the Rose of Jericho from its water. I spared a bit of the water in a little clay jug for utilization in future workings, and placed the rest in front of my house door, to keep away the evil spirits. At the point when the Rose of Jericho is expelled from its water source, it starts to gradually come back to its lethargic state, its leaves turning back to brown. The thought is to seal your appeal inside the shut plant until the time that it is conceded. As of right now, utilizing a little decrease light I lit my Master Candle and permitted it to burn, while I started to build my summon. Taking a little bit of paper, I composed my summon out, while focusing on it being fulfilled. I then anointed the paper in a five-face-kick the bucket design, one spot in every corner and one in the inside. For this work, I utilized a ritual Blessing Oil. After the anointing, the next step I took, was to fold the paper into equal sized parts once, towards my body. At that point into equal parts once more, and after that I folded again and again. Continuously towards my individual, and continually focusing and meditating on my coveted desired result. At that point, I put the summon amidst the still open plant, on my sacred place, alongside two little sacred objects (could be some dried white sage or a small devi statue). I decreased the flame and then transferred the light from my Master Candle to my Saint Expedite light, both on my sacrificial stone. At that point, I said a little prayer to God and Saint Expedite, requesting that he loan his grace to my appeal. To continue anything from deferring it, to “speed up” it if conceivable, and to prevent those included from delaying on anything that may ease off my appeal. Consequently, I pledged that, once the summon was in all actuality, I would light a red flame in his respect each Wednesday for a year, and give him offerings of fresh cut flowers and to burn incense. I permitted the flame to burn for a few couple of hours before turning it off, and I will keep on lighting it consistently until it is gone. 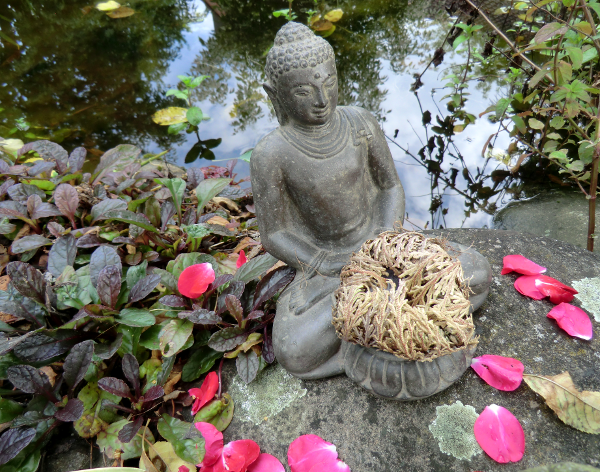 When the wish had been granted by the summoned spirit of the plant, I will use the bowl in which the Rose of Jericho had been placed for my offerings of blooms to the Saint. At the point when the request is truly, I will put the Rose of Jericho back in water, where it will open and transition from a brown ball into a green and lush plant (this resurrection can be repeated almost endlessly, but please read on how to take care of these plants). I will also remove any items that were used in the ritual and will clean the bowl thoroughly. When the bowl has been cleaned, the Rose of Jericho plant is ready for new works. I will likewise start my grateful offerings to Saint Expedite, for a year, from that day onward. Take a gold trim strip and a red lace and tie them together making three bunches at the same time focusing on your longing and say these words. Heavenly Rose of Jericho, for the gift you got, encased with the temperances and forces given to you by our Lord Jesus Christ and his unbounded grace, I implore you to help me stay solid and restore my wellbeing, so that I may manage existence with the quality and influence important to defeat each impediment that introduced itself in my way. So be it. There are endless ways one can work with Rose of Jericho plants, the character of the plant itself and the Spirit inside of it are dealt with humbleness and respect. If treated like this, it will give you favors and insurance in your life. Additionally the supplications to God can be altered and changed to suite your motivation. If one uses coins or charms inside of the water of the Rose of Jericho, these could be used as items to fill lucky charms and be given to customers of your business. have in the adoration for Jesus Christ and His incredible leniency. So be it. May your Rosa De Jericho bring you luck. In many countries, the Rose of Jericho is said to bring luck to its owners and it is passed from generation to generation. You don’t need to believe in any qualities or stories about these plants, and I surely do not promise that any of these will work – but it’s always good to have some stories or explanations about anything that you sell. You know, these are just stories.